Motorola started selling its v-series phones more than a year ago. They were so similar that the variety in the line was so poor and concerned design more than the menu and hardware architecture. The triplets as v300, v500 and v600 are called turned out to be successful and the platform used in them became standard for the company. Many of us remember that the release was postponed several times and that was connected only with the novelty of the hardware platform. Then after all the models based on the same platform appeared very soon and there were no any principal reasons for the release. Not technical problems were the restrictions but marketing solutions. It was necessary to prolong the perception of previous models and increase their sales. The task was solved but troubles appeared. The triplets were supposed to serve as an entry ticket for the middle-price segment and then will be replaced with renewed models of similar design but a bit changed software (the main thing was recording video and not only reproducing). The idea was attractive because the change of generations and the appearance of the devices similar in price provided potential for growth. The frustration of triplets change period and their long life circle made the company refuse its plans. Nevertheless the triplets get the renewed versions and we'll see them in this or that appearance in the whole 2005. The first wave of renewals includes Motorola v535, E550 (the same as 535 model but a bit differs in the appearance but not a form), v620. The second wave will be formed by v635 model that will be announced officially in January and by all its derivatives in cheaper segments. I'd like to note we won't describe basic functionality of the triplets in this review, we've already done it in details. And here we'll speak about the differences and new functions. The design of v620 is a complete copy of v600 the only difference is in the fact the panels are black instead of a silvery metallic. The renewed version looks more elegant and stylish jut like the majority of the devices in this price segment. Some people say the panels are velvety by touch but that's not right and this is a usual paint. The feeling appears due to the fact a hand doesn't slide so freely like in v600 case with its polished body. None of the people who held the device noticed a new opening angle that is a couple degrees different. Technologically that's done for better perception of the majority, the manufacturer just took the wishes of the users into account. The second difference is that Call and End call buttons exchanged their places and the device is similar to the phones by other manufacturers now. 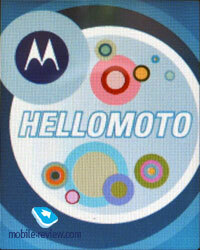 Only Motorola followed the original disposition of buttons and that was thought over in the ergonomics terms. Other companies tried to think out a unique function and thus stress the difference from the founder of the mobile connection and this lead to a standard disposition of keys (End call to the left and Call to the right). This disposition is for those who dial a number holding the device in the left hand. The thumb lies well on the Call button then. I really doubt there number of right-handers decreased al over the world and that's why the explanation of the disposition should be looked for not in ergonomics but in the generally accepted standard. 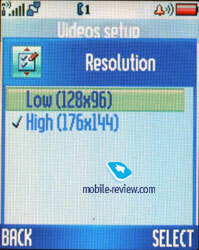 The screen is 262K and has the same resolution as v600, that is 176x220 pixels by the way its physical size is the same. 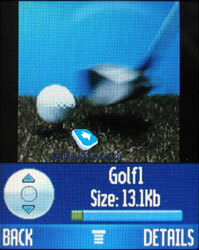 Sharp matrix is still used in the phone and it remains one of the best in the market. The triplets are quite comparable with the devices by Samsung, Sharp in the quality of the screen. And as for me, a 65K screen can easily compete with a 262K one. Technologically v620 got a new screen controller that is responsible for showing the majority of the colors. And thus if you take software for the elder model and install it in v600 you'll get a "dead" device without the screen working. The frontal solution is not acceptable and some alternate routes are necessary. 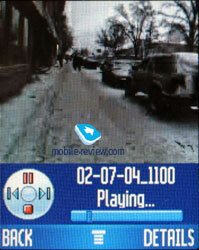 You may consider it a hint and try to add v620 functions to the younger models. Straight comparison of the v620 screen with similar ones in v500 and v600 indicated the picture doesn't look better (though it should) and is more faded and dull. 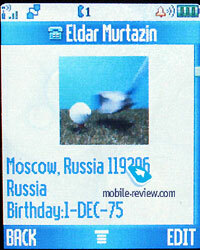 The explanation by one of the specialists (not from Motorola, the company made no comments) sounded very probable. In short it meant besides installing a new controller you need to create a new profile describing the screen work and its new possibilities. And this setup of the profile allows achieving better picture representing and its qualitative improvement. And in some moment this got out of sight here. The quality of the screen doesn't potentially differ from younger models and really it is a bit worse in the first deliveries (the question concerns only software part and the quality of the picture will change with the software change). So, we have finished with hardware and now can switch to software solutions. The device got Skins similar to E398. It changes window design, color scheme, clock type in the standby mode and the main screen. Despite the names of the Skins are similar to E398 they differ greatly. That seems natural in some way and nobody told they would be the same. The fact the names of the windows are not changed may be considered a disadvantage (they stay the same and that is different to E398). The second main change concerns the phone book; new fields appeared for a name. And if earlier you could enter 100 names with one number, e-mail address, personal photo and a call melody now the phone book possibilities are not limited with that. New fields are called Nickname (used in ICQ and similar programs and has no any straight use here), fields for entering a post address (two fields for a street, fields for a city, state, post index and a country), birthday (but there is no a memo here still). This increase of the fields' number may be considered a real advantage of the device and many had been complaining of the absence of a post address field in evident view. 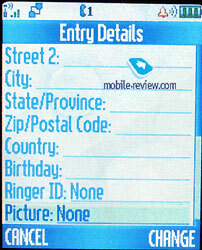 When viewing only Primary Contacts you see a photo and a text note under it, having much data you may use a scroll. There is no any fast switch from one number to another. You need to scroll the whole information before you see another number and this may be considered a minus. 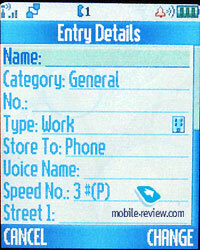 At the same time all the text fields may be saved for a number and this is absent in any other phone. The phone book is an intermediate variant in some way and not the worst to my mind. There are no problems with switching between the names when they are represented one after another. And the types of the saved numbers are shown that makes no trouble selecting them. Search is only by one letter. The speed of moving along the menu and phone response haven't changed. Some people think the triplets are fast and some say they aren't. And that is a matter of taste to my mind. And so we get a not bad clamshell with a customary set of functions, metallic body and a pleasant design. The device has not so many rivals for the moment. 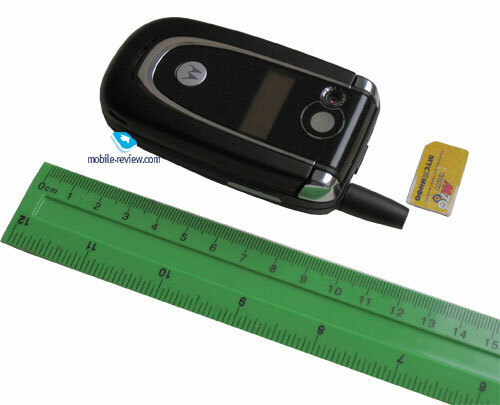 Considering the fact the sales will start in the beginning of January and the price is only 30-40 USD higher than of Motorola v600 the model considered in the review may be considered a successful one.